Polish *Aramus daughter. This exciting stallion has just begun showing. Grand Champion. Superior lines, being an *El Paso son out of an *Aladdinn daughter. Has multiple NATIONAL Champion foals! Sire of AMAHA 4x HOTY and 2x Hall Of Fame award winner Foxfire Zarek+++ and 2008 AMAHA Reserve Horse Of The Year and Hall of Fame winning Anglo Arabian gelding Foxfire Melvin+++. 1994 Bay Stallion. Live Show winner, 2005 AMAHA Res. National Champion. Excellent Bloodlines including Bandos, Negatiw, Wielki Szlem, *Bask and Naborr. 1994 Bay Stallion. Live Show placed, excellent halter stallion. Bloodlines include Palas, *Aramus and *Bask. 1996 Grey Stallion. Live show winner, bloodlines tracing to *Etiw 2x, *Bask and Bandos. 1998 Bay Stallion. One of the winningest horses in AMAHA recent history! Multiple times AMAHA Nationals Grand Champion in both Halter and Performance. 2003, 2004, 2006, 2007, 2010 AMAHA HORSE OF THE YEAR! 2004 NAN Top Ten 2x! TWICE AN AMAHA HALL OF FAME AWARD WINNER! Region 8 Res. Champion OF Resin Arabian, as well as multiple Region 8 Championships, Reserves and Top Tens in Performance! Champion Sire of both halter and performance horses. breeding herd, as she is not available to outside breedings! and has a lovely daughter in the showring already. We expect great things from this handsome gentleman! 2000 fleabitten grey Arabian stallion. Live show champion, Multiple times photo show halter champion, YEA winner. Excellent bloodlines with crosses to *Etiw, Bask, Muzulmanin and Bandos. 2002 black rabicano stallion. Limited showing, excellent bloodlines tracing to close up crosses to Bask, El Paso and Perfector. 2003 blood bay stallion. Excellent showhorse. Bloodlines to Pepi, Celebes, Wosk and Fortel. Bred by Persimmon Hill. 2004 grey (chestnut) stallion. Champion halter horse. 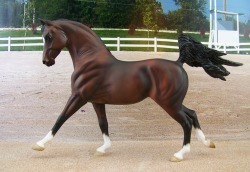 The real stallion Kordelas was a champion reining and halter horse, and sire of US National champions. Bloodlines trace to Palas, Monogramm, Aladdinn and Muzulmanin. halter. Dam of several fine show horses, including 2005 AMAHA Res. National champion Foxfire Windstorm. Excellent lines with crosses to *Bask, *Naborr, *Druchna, and Comet. 1988 Bay mare. Many times Halter and Most Classic Champion, Live show placed! Excellent bloodlines. Dam of Foxfire Zarek+++, 4x AMAHA HOTY, 2x Hall Of Fame Award winner! PHOTO APPROVAL OF FOALS REQUIRED! NAME MUST START WITH "Z". 1988 bay mare. Unshown, dam of 2001 NAN Champion and AMAHA Champion Foxfire Amazar Star. 1988 black mare. Photo show winner, excellent halter mare and dam of a winning show filly. Bloodlines include Probat, Eukaliptus and Palas. Bred by Persimmon Hill. 1989 Chestnut mare. Limited showing with excellent results. Wonderful lines, tracing to *Bask, Comet and *Aladdinn. generations, also carries *Bask and Rozmaryn. OPEN: 95, 96, 97, 98, 99, 00, 01, 02, 03, 04, 05, 06, 07, 08, 09, 10, 11, 12, 13, 14,, 15 Pensioned, no foals after 2015. Ofir, with close crosses to *Aladdinn and *Gwar. to Celebes, *Flis and *Bask. 1991 grey mare. Unshown, lovely, old Polish bloodlines tracing to Fontaz, Branibor Bandos and Magyar. Bred by Cory Hartung/double Hart Ranch. to *Bask, *Aladdinn, Comet and Czort. to *Muzulmanin, *Aladdinn and *Etiw. 1992 grey Arabian mare. Unshown, bloodlines tracing to Bask 2x, Konstant and Eternit. Bred by Caballos Del Mar/Kay Myers. 1993 bay Arabian Mare. Currently Unshown. Daughter of our National Champion sire Foxfire Mahzad and out of one of our best mares! Bloodlines include *El Paso, *Bask and Aladdinn. 1993 chestnut mare. Unshown, but with excellent bloodlines. Traces to Monogramm, Gondolier, Bandos and Partner. Bred by Laurel Dedes. 1995 grey Arabian Mare. Unshown, bloodlines tracing to Bask, Negatiw, Penitant and Tryptyk. Bred by Caballos Del Mar/Kay Myers. champion show mare! Lines to *El Paso, *Alladdin, Cognac, and Palas. 1997 bay Arabian mare. Currently Unshown. Royal bloodlines! Sire is our legendary Classified+, dam is farm favorite Foxfire Keysha Nakira. Bloodlines include *Bask, Gedymin and Well Chosen. 1998 chestnut Arabian mare. Currently Unshown, first daughter of our National champion stallion Foxfire Windstorm! Bloodlines include *Muzulmanin, *Sambor, Naborr and *El Mundo. 1998 golden bay Arabian mare. Many times champion and Grand champion, AMAHA Junior Champion. Excellent bloodlines with crosses to Negatiw, Bandos, El Azrak and El Mudir. 2000 grey Arabian mare. Champion halter filly. Top lines including *Etiw, Dramborr, Naborr and *Bask. Foal body, real time Foxfire bred foal. 2000 chestnut Arabian mare. Champion Halter filly. Top lines including *Muzulmanin 2x, *Aladdinn, and El Azrak. Foal Body, real time bred Foxfire foal. 2000 bay Arabian mare. Nice show filly in limited outings. Bloodlines include *Gwalior, *Aladdinn and *El Paso. Foal Body, real time bred Foxfire foal. 2000 bay Arabian mare. Good show filly in limited outings. Bloodlines include *El Paso, *Aladdinn and Gedymin. Foal Body, real time bred Foxfire foal. 2000 dark chestnut Arabian Mare. Champion halter mare. Bloodlines to MS Ellusion, Grand, Aquinor, Eleuzis and Czort. Bred by Double Hart Ranch. 2001 Grey (Black) Arabian mare. LSW, photo show champion. Excellent bloodlines including *Bask 3x, *Etiw and Negatiw. Foal Body, real time bred Foxfire foal. 2001 grey (black) Arabian Mare. LSP, champion halter filly. Excellent bloodlines including *Etiw, Gwalior and Engano. Foal Body, real time bred Foxfire foal. 2001 bay Arabian mare. Excellent show filly with several halter championships. Bloodlines include *El Paso, Celebes and*Aladdinn. Foal Body, real time bred Foxfire foal. 2001 bay Arabian mare. Limited showing with good results, bred to be a performance horse! Lines include *El Paso, Ofir and Celadinn. Foal Body, real time bred Foxfire foal. 2001 bay Arabian mare. Limited showing with excellent results. Bloodlines include Promotion, Aloes and Bandos. Foal Body, real time bred Foxfire foal. 2001 grey Arabian mare. Excellent shower with many championships. Top bloodlines including *Enoss, *Bask and *El Paso. Foal Body, real time bred Foxfire foal. 2001 bay mare. Live show placed, excellent lines tracing to Bask 2x, Ariston and Arax. Bred by Cory Hartung/Double Hart Ranch. 2002 dapple grey Arabian mare. EXCELLENT show mare, Many times Champion/Grand champion. Live show champion. First foal of our AMAHA Hall Of Fame horse Zarek and out of one of our very best mares. 2003 grey <black> mare. Live Show Champion. Superior pedigree. Permanent foal body as she is a real-time bred Foxfire foal. 2004 bay mare. Excellent halter show record in limited showing, lovely bloodlines tracing to AAF Kaset, Muzulmanin, *Aladdinn and Cognac. Real time bred Foxfire foal so has a permanent foal body. 2004 chestnut sabino mare. Currently unshown, bloodlines tracing to Muzulmanin, El Paso and Cognac. 2005 bay mare. Currently unshown, excellent bloodlines tracing to El Paso, el Mundo and Aladdinn. 2005 grey mare. Live show placed. Multi champion Halter mare. Superior pedigree, and out of our best producing mare Foxfire Zytka. Half sister to 2 time AMAHA Hall Of Fame stallion Foxfire Zarek+++. 2006 bay mare. Multi halter champion, AMAHA Halter LOM winner. Top of the line pedigree tracing to El Paso, Gwalior, etc. Real time bred Foxfire foal, so has a permanent foal body. 2006 dapple grey (bay) Mare. Unshown, bloodlines tracing to Palas, Penitent, Europia and Bask. Bred by Persimmon Hill. 2007 bay mare. Live show winner, photo show placed. Bloodlines to El Paso, Aladdinn and Muzulmanin. Real time bred Foxfire foal so has permanent foal body. 2007 bay mare. Live show champion, photo show winner, YEA winner. Bloodlines to El Paso, Celebes and Comet. Real time bred Foxfire foal so has permanent foal body. 2008 bay mare. Live show winner, limited outings in photo shows. Bloodlines to Muzulmanin, Aladdinn and El Paso. Real Time bred Foxfire foal so has a permanent foal body.